When buying a horse, we always advise that you have any potential purchases thoroughly evaluated by a vet. We offer pre-purchase examinations (vettings) to both existing and external clients, with simple packages and no hidden charges. There are two types of vettings; two stage/limited or five stage/full vetting. We cover a large area for pre purchase examinations. What does a pre-purchase examination include? A two stage vetting includes only stages one and two whereas a five stage vetting includes all five stages. 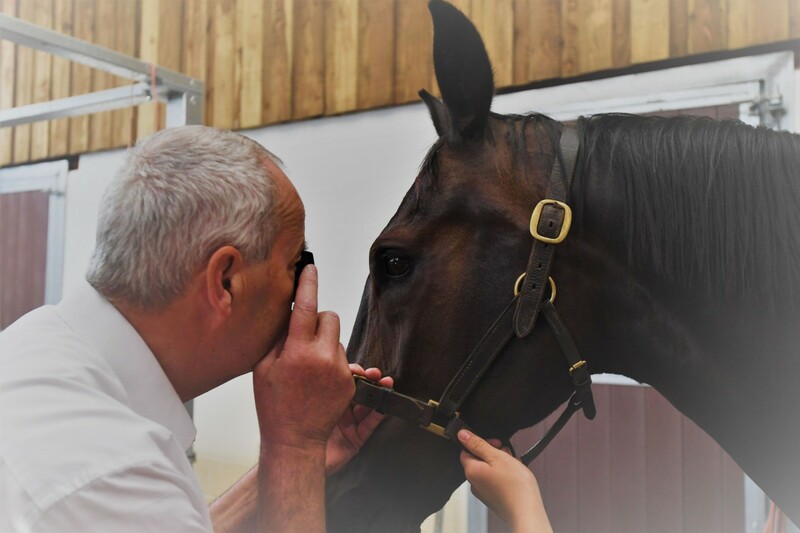 The first step for any vetting, once it is booked in, is the vet will contact you beforehand to have a chat regards any concerns you have and your requirements for the horse and most importantly introduce themselves. This involves assessing the horses conformation, listening to its heart, checking eyes and assessing any lumps and bumps. The horse is walked and trotted in-hand on a hard surface. Flexion tests are performed of all four limbs and trotting on a circle on a hard surface is performed, if it is safe to do so. This is where a two stage vetting would stop. This horse is ridden to give sufficient exercise to assess the horses wind and increased heart rate and gait. The vet will observe the horse whilst it recovers from the exercise phase. The horse is trotted up again +/- flexion tests. This allows for any signs of strains or injuries made evident by the exercise and rest phases. A blood sample is also taken and stored for 6 months. The blood sample can be run by the lab at an extra charge if the purchaser requires. A full or part set of x-rays.